Identification of variation in pasture use by domesticated livestock has important implications for understanding the scale of animal husbandry and landscape use in modern and ancient societies alike. Here, we explore the influence of pasture floral composition, salinity, and water availability on the carbon (δ13C) and nitrogen (δ15N) isotopic composition of plants from the steppes of Kazakhstan. Our findings demonstrate geospatially defined differences in the isotopic composition of sedge marshes, saline marshes, and meadow steppes, information which we then use to inform animal management strategies used in the past. 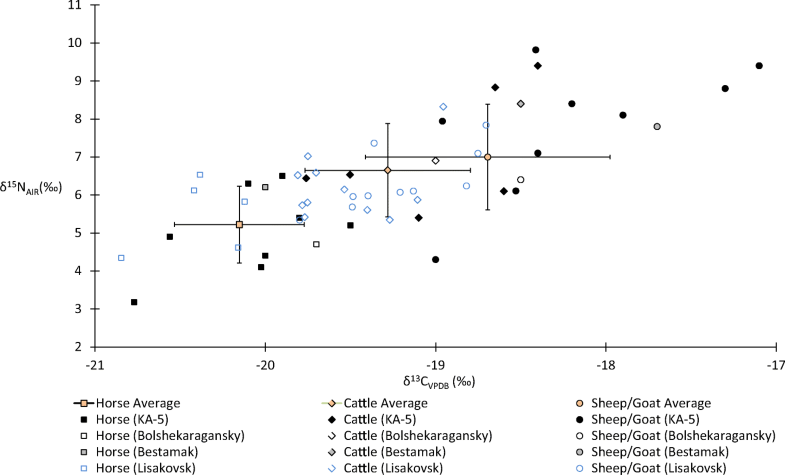 We then examine pasture usage by ancient livestock through carbon and nitrogen isotope analyses of bone collagen from animals that grazed in the northern Kazakh steppe. 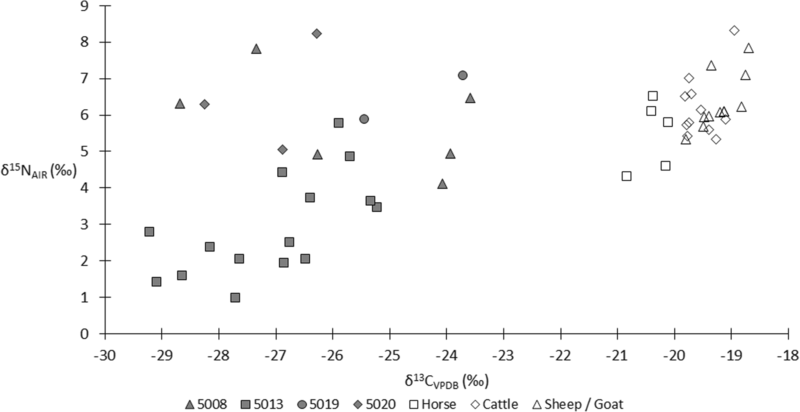 Pasturing strategies varied according to livestock taxa, with horses exhibiting lower δ13C and δ15N values relative to cattle, sheep, and goat. We argue that horses, which are highly mobile and freely graze over pastures extending over wide areas, were grazed under an extensive pasturing system. These data suggest that the isotopic composition of contemporary vegetation communities can help inform animal management strategies used in the past. The online version of this article ( https://doi.org/10.1007/s12520-018-0660-4) contains supplementary material, which is available to authorized users. A correction to this article is available online at https://doi.org/10.1007/s12520-019-00820-9. Pastoralists employ a diverse set of animal management strategies to ensure their subsistence and that of their herds. One important husbandry practice involves moving livestock to different pastures in order provide herd animals with a continuous source of fresh graze (Wright and Makarewicz 2015; Outram 2015). The spatial extent of pasturing systems and the intensity of pasture use depend on a complex intersect of ecological and social factors including seasonality, graze availability, water point, predators, stocking rate, and pasture access rights (Fernandez-Gimenez 2000, 2002; Kerven et al. 2006; Milner-Gulland et al. 2006; Kerven et al. 2016). While the intensity of pasture usage structures pastoralist movement and has direct consequences for the health of pastoral herds, little is known about pasturing intensity for different livestock species in prehistoric pastoralist contexts. Typically, contemporary pastoralists partition their herd animals into different groups depending on species, age, and animal value. These separate herds are then directed to different pastures according to the quantity and quality of pasturage in order to balance graze intake and (re)productive output (Fernandez-Gimenez 2000; Fernandez-Gimenez 2002; Kerven et al. 2016). The practice of partitioning herds and subsequent dispersal of animals to different pastures is widely practiced in pastoralist societies across the globe. Contemporary agro-pastoralists in Kazakhstan also employ several variants of this herd management strategy, taking advantage of diverse forage quality and quantity on the landscape, both of which vary on a seasonal basis (Robinson et al. 2003; Kerven et al. 2006; Schillhorn van Veen et al. 2003; Kerven et al. 2016). These include intensive pasturing strategies involving grazing of herds (cattle, goats) within 5 km of small villages and more extensive herding strategies that place herds onto distant pastures up to 20 km from settled areas (horse, cattle, sheep, goat) (Kerven et al. 2006, 2016). Some herders graze livestock at distant pastures more than 20 km from village while others entrust their livestock to owners of remote pastures (Kerven et al. 2006; Kerven et al. 2016). Pasture stocking rates (density of animals grazing per acre) vary depending on local environmental conditions that in turn influence the spatial extent of pasturing systems. For example, locations that receive higher amounts of precipitation, which promotes pasture growth, tend to support high herd densities even for heavily subscribed pastures located near villages (Robinson et al. 2003; Kerven et al. 2006; Kerven et al. 2016). Kazakh herders also divide small-stock and large-stock into separate pastures. Cattle are frequently grazed on low-quality forage (e.g., coarse reeds) in river floodplains and saline marshes located within 5 to 20 km villages. During the milking season, lactating cows and suckling calves are often grazed on higher-quality pastures located near villages (Robinson et al. 2003; Kerven 2016). Sheep and goats are often grazed in the open steppe where they feed on shorter herbs and finer grasses that can be grazed all year (Kerven 2016). While all livestock roam somewhat freely, horses are the most autonomous and least likely to be attacked by predators; therefore, they range the farthest from villages searching for appropriate vegetation (Kerven et al. 2016). Establishing the scale and intensity of pasture use by different livestock species potentially provides insights into pastoralist adaptations to shifting graze availability and social landscapes (Honeychurch and Makarewicz 2016). However, the extent of pasture use by ancient steppe pastoralists has so far only been indirectly inferred based on the distribution, size, and occupation density of prehistoric settlements (Epimakhov 2002; Epimakhov 2009; Frachetti 2009; Hanks 2009; Batanina and Hanks 2013). Here, we explore pasture use by different livestock taxa during the second millennium cal BCE in the northern Kazakh steppe through carbon and nitrogen isotope analyses of caprines, cattle, and horse remains recovered from MBA sites of Bestamak, Kamennyi Ambar, and Bolshekaragansky alongside the LBA site of Lisakovsk. Stable isotope analysis provides a direct measure of livestock dietary intake and offers a powerful means to evaluate the spatial and temporal dynamics of pasture use in modern and ancient pastoralist societies (Makarewicz 2014, 2017). However, there is a dearth of information describing the distribution of carbon and nitrogen isotopes in steppe pastures which challenges a close understanding of the mechanisms influencing the carbon and nitrogen isotopic composition of livestock tissues. To this end, we analyze carbon and nitrogen isotopes of contemporary plants obtained from spatially disparate pastures located in distinct vegetation communities in the northern Kazakh steppe. In doing so, we broadly establish the relationship between water availability and soil salinity in the landscape and the distribution of isotopic composition of plants. The Middle to Late Bronze Age (2200 to 1400 cal BCE) in the northern Kazakh steppe encompassed a major shift in settlement patterns from semi-sedentary pastoralism to more dispersed, mobile lifeways engaged in pastoral nomadism (Tkacheva 1999; Grigory’ev 2002; Koryakova and Epimakhov 2007; Kuz’mina 2007; Tkacheva and Tkachev 2008). Middle Bronze Age (2200 to 1700 cal BCE) settlements had large enclosures consisting of an earthen wall and ditch. Inside the enclosure, earthen domestic structures with shared walls (numbering from 30 to 60) housed an estimated 200 to 700 individuals (Gening et al. 1992; Grigor’yev 2002; Anthony 2007; Kohl 2007; Koryakova and Epimakhov 2007; Hanks 2009; Batanina and Hanks 2013). MBA settlements were repeatedly occupied, evidenced by successive building phases that added structures and enlarged enclosures. Aggregated MBA sites are situated between 40 and 60 km apart, and landscapes between enclosed settlements may have been territories of particular settlements (Epimakhov 2002; Zdanovich and Batanina 2002; Merrony et al. 2009; Stobbe et al. 2016). While there is currently no archeological evidence for structures such as animal corrals or walls outside of MBA settlement enclosures, open areas within settlements may have been used to house livestock. Reconstructions of landscape use in the vicinity of MBA sites determined that pastures within 4 km of the site could have supported herd sizes large enough to sustain sedentary livestock herders (Stobbe et al. 2016). During the subsequent Late Bronze Age (1800 to1400 cal BCE) settlements were more dispersed across the landscape and significantly smaller, consisting of fewer than 20 dwellings, further lacking enclosures and building phases (Kuz’mina 2007:36–8; Zakh and Ilyushina 2010). This shift in settlement size and distribution has been interpreted to indicate the emergence of nomadic pastoralism and the intensification of long-distance mobility (Tkacheva 1999; Grigory’ev 2000; Kuz’mina 2007; Tkacheva and Tkachev 2008). The carbon isotopic composition of terrestrial plants varies according to photosynthetic pathway and modifying environmental variables. C3 pathway plants exhibit low δ13C values ranging from − 20 to − 31‰ while C4 pathway plants exhibit higher, but a more limited range, of δ13C values from − 12 to 16‰ (O’Leary 1981, 1988; Farquhar et al. 1989). In the Eurasian steppe, floral biomes are composed of a mix of grasses and flowering non-woody C3 plants and C4 grasses and Chenopodiaceae (Toderich et al. 2007). The carbon isotope composition of plants is influenced by salinity, aridity, and water availability. For C3 plants, water availability exhibits a negative relationship with plant δ13C values (Farquhar et al. 1989; Farquhar 1991; Stewart et al. 1995), while there is little to no correlation between water availability and the δ13C values of C4 plants (Farquhar et al. 1989; Swap et al. 2004; for slight positive correlation, see Murphy and Bowman 2009). Variation in δ13C values between C4 plants is lower than between C3 plants, and primarily the result of differences in bundle sheath leakage (Bowman et al. 1989). The water-use efficiency of C3 plants increases when water availability decreases, leading to 13C enrichment in leaf carbon (Farquhar et al. 1982a; Farquhar et al. 1989; Lajtha and Getz 1993). High soil salinity, which reduces floral water uptake capacity, contributes up to 3‰ enrichment in 13C of plant tissues (leaves, stems, roots) of both halophytic and non-halophytic species (Farquhar et al. 1982b; Bowman et al. 1989; Hokmabadi et al. 2005; Wei et al. 2008). Irradiance also influences foliar δ13C values, where higher solar irradiance is associated with 13C-enrichment of leaves (Ehrlinger et al. 1986). Differences in δ13C associated with irradiance are attributed to variation in intercellular CO2 concentration (Farquhar et al. 1982a). The δ15N values of plants are determined by source nitrogen and whether nitrogen is taken up by plants directly from soil nitrogen pools or if this process is mediated by symbiotic microbes (Evans 2007; Szpak et al. 2013, Szpak 2014). A negative relationship has been observed between mean annual precipitation and the nitrogen isotopic composition of foliage (Handley et al. 1999; Amundson et al. 2003) with high foliar δ15N values typical for arid environments. (Virginia and Delwiche 1982; Handley et al. 1999; van Groenigen and van Kessel 2002). Soil salinity also influences plant δ15N values, with plants growing in saline soils enriched in 15N from 4 to 10‰ higher than those growing in non-saline soils (Heaton 1987). The addition of 15N-enriched manure, either intentionally applied to enhance agricultural plots or by animals grazing in pastures, to soils also contributes to high δ15N values in plant tissues (Bogaard et al. 2007; Fraser et al. 2011; Szpak et al. 2012; Makarewicz 2014). Animal manure in pastures has been shown to increase the δ15N values of pastures which is reflected in the 15N-enriched tissues of animals grazing in these pastures (Makarewicz 2014). A few studies have systematically documented variation in the underlying floral biome in the Eurasian steppe (Liu et al. 2004; Makarewicz and Tuross 2006; Zhou et al. 2006; Wittmer et al. 2010; Shishlina et al. 2012; Makarewicz 2014). Some of these studies indicate an increase in the abundance of C4 plant species with increasing aridity (Zhou et al. 2006; Wittmer et al. 2010; Wang et al. 2013). Contemporary livestock grazing on steppe pastures exhibit 13C enrichment in hair keratin with increasing aridity reflecting ingestion of both C4 and water stressed C3 graze (Auerswald et al. 2012; Auerswald et al. 2009). There is also high isotopic variation in steppe floral biomes, due to local differences in soil nitrogen sources (Makarewicz 2014). Seasonality also drives nitrogen isotopic variation in pastures, with winter season pastures enriched in 15N compared to summer pastures, reflecting concentrated manure input by large herds in restricted areas (Makarewicz 2014). The northern Kazakh steppe is a dry upland biome, encompassing the two study areas which are located in the Turgay plateau of Kostanai Oblast’ (province) consisting of the broadly defined Trans-Ural Turgay steppe phytogeographic zone (Rachkovskaya and Bragina 2012; Deák et al. 2016, Fig. 1). Fescue-feather grass steppe and xerophytic forb-feather grass steppe dominate this region (Rachkovskaya and Bragina 2012; Bragina 2016) and are interspersed with several distinct vegetation communities including sedge marshes, meadow steppes, and saline marshes. Sedge marshes grow in watery depressions alongside willow brushwoods, while xerophytic forbs, fescues, and grasses including sagebrush and bunchgrass are found in dry or salt marsh zones. Relic pine forests are interspersed with meadow steppes adjacent to lake terraces (Rachkovskaya and Bragina 2012). Precipitation for the Trans-Ural Turgay steppe averages 310 mm per year, with ca. 120 mm falling during the summer months (Ilyakova et al. 2015). The summer is generally dry and hot, reaching maximum temperatures of 28 °C, with intermittent rain storms (Ilyakova et al. 2015). Winters are cold with average January temperature of − 18 °C and low temperatures reaching − 42 °C. The study areas have slightly undulating topographic relief, often under 10 m in variation, yet depressions capture surface water after snowmelt and due to runoff while upland locations with slightly higher elevations are drier (De Pauw 2007). The few paleoclimate reconstructions of the Turgay plateau are based on analyses of pollen, macro-remains preserved in peat, and spectral photometry of soils (Krementski 1997; Kremenetski et al. 1997a; Kremenetski et al. 1997b; Stobbe et al. 2015; Stobbe et al. 2016). A study by Krementeski et al. (1997a, 1997b) of a lake core from Mokhovoe Lake (Kostanai Oblast’), between the Tobol and Ubagan Rivers, exhibits a hiatus in sediment deposition between 2500 and 900 cal BCE. This hiatus corresponds with the Bronze Age and was interpreted to indicate a period of aridity (Kremenetski et al. 1997a). In contrast, recent sedimentological and palynological evidence from the site of Kamennyi Ambar in the southern Trans-Urals suggests that the climate was relatively humid, similar to the modern period, from 2400 to 1750 cal BCE (Stobbe et al. 2015). The latter dataset is further supported by macro-remains excavated from Bronze Age settlements in the southern Trans-Urals and pollen from off-site archives for paleoenvironmental reconstruction (Stobbe et al. 2016). Off-site pollen archives are located outside of the archeological settlement but in buried soils that have been radiocarbon dated. These results suggest that the composition of vegetation has remained fairly similar between modern day and Bronze Age pollen assemblages and that these vegetation patterns may result from similar climatic conditions. We investigate the scale of Bronze Age pasture use on the Turgay plateau in part through investigation of the carbon and nitrogen isotopic composition of contemporary plants obtained from distinct vegetation communities situated near the prehistoric settlements of Bestamak and Lisakovsk. The Middle Bronze Age site of Bestamak is located near the confluence of the Buruktal and Ubagan rivers with numerous lakes dotting the landscape and the Late Bronze Age site of Lisakovsk located in the open steppe along the Tobol River. Sample units were placed to capture the diverse vegetation communities present in this region of the northern Kazakh steppe, including riverine, salt lake, marsh, elevated plateau, and grassland zones. Areas affected by anthropogenic inputs that might influence, in particular, the nitrogen isotope composition of sampled plants were avoided. This does not include manuring as part of pasture use by livestock, which could not be avoided. Plants were sampled from a total of 37 collection units (each measuring 1 m2) from Bestamak and 43 (1 m2) units from Lisakovsk between July 30, 2014 and August 27, 2014. At Bestamak, plants were collected from 31 units in the open steppe, 4 units near rivers or streams, 1 near a saline lake, and 1 in a partially forested area. In the Lisakovsk study area, a total of 35 units were located in the open steppe, 4 near rivers, 1 next to a freshwater lake, 2 near saline lakes, and 1 unit in a partially forested area. Every plant species within each unit was collected in duplicate and identified to genus and, when possible, to species alongside Russian language folk taxonomy by a trained botanist (Supplementary Tables 1 and 2). While in the field plant species were counted within each sampling unit, and these counts were used to calculate the relative abundance of each species (by m2). We also calculated the distribution of C3 and C4 plants by unit and plant functional types. Plant functional types included grasses, flowering non-woody plants, trees, and shrubs. Two examples of each plant species were collected from every unit, and plants were placed on moisture extraction paper after collection. A total of 88 plant specimens, representing 3 functional types and 29 species, were analyzed for carbon and nitrogen isotopes from 10 collection units (each measuring 1 m2) around the site of Bestamak. Collection units were placed in the open steppe (n = 7), at the edge of a marsh (n = 1), near a salt lake (n = 1), and on the lower bank of the Ubagan River (n = 1) (Fig. 2). In the Lisakovsk study area, 28 modern plants consisting of 20 species that represent three functional types were analyzed from four collection units. Collection units were located in the open steppe (n = 2), at the lower bank of the Tobol River (n = 1), and at the edge of a saline lake (n = 1) (Fig. 2). Plants were washed with ultra-pure deionized water to eliminate superficial contaminants including soil or dung and then oven dried at 60 °C. Plants were then subsampled and homogenized by combining leaf, stem, and seed parts. All plant parts that were above the soil were included in the isotopic study as these are all ingested by livestock. Samples were analyzed for δ13C and δ15N in continuous flow mode on a Eurovector elemental analyzer interfaced with a GV Instruments IsoPrime isotope ratio mass spectrometer at the Boston University Stable Isotope Laboratory. The analytical error for δ13C and δ15N measurements from the same sample, was determined at ± 0.2‰ (1σ), or better. Percent abundance of C4 plants was calculated for each unit as the number of C4 plants per unit divided by the number of total plants per unit. Percent abundance, of C4 plants by study area, was calculated for each 1m2, then added together and divided by the total number of square meters. Isoscapes are spatially defined predictions of isotope ratios computed for a given landscape according to known isotope-fractionation processes and environmental factors that influence isotope values (Bowen 2010: West et al. 2010). Isoscapes help constrain the range of isotopic variation with a given area and, consequently, are a useful means for exploring spatially derived variation in the isotopic composition of animals moving within a landscape (Wunder 2010). Here, we constructed isoscapes by mapping the results of isotopic analyses of modern plants collected from the contemporary landscape. Plant collection units were geo-referenced and assigned δ13C values based on the abundance of plant functional types. The δ13C composition of vegetation in units with measured isotope values was calculated by weighting the δ13C value for each plant species according to the abundance of each species. Units lacking measured isotope values were assigned a carbon isotope value calculated from an average value derived from each plant functional type multiplied by the percent abundance of that group in each unit. Average values of plant functional types were calculated separately for grasses, flowering non-woody plants, and other plants. Carbon isotope values were adjusted by + 1.5‰ for the Suess Effect (Keeling 1979; Yakir 2011). The δ15N composition of vegetation was estimated in the same way, using measured values to estimate values by unit and plant functional type abundance. Isoscapes were made in ArcGIS Pro ver. 2.1 by interpolating carbon, or nitrogen, values using a spline function with barriers. In the spline interpolation method, a raster surface is created from points using a minimum curvature spline technique. Barriers were created from polygons of rivers, lakes, and ponds. A minimum curvature surface both honors the input data and applies a deformation to each cell calculated by comparing the weighted sum of 12 neighboring cells with the current value of a target cell to calculate a new value for the target cell (Terzopoulos 1988). The stable isotope ratios of bone collagen record dietary intake (DeNiro and Epstein 1978; Tieszen et al. 1983) and geographical information, which occurs as carbon and nitrogen isotope variation in the underlying floral biome is integrated into the tissues of herbivores as they graze on vegetation. The isotopic composition of bone collagen reflects a “lifetime average” of dietary intake over several years (Hedges et al. 2007). Previously published faunal collagen isotope data was compiled from sites located in northern Kazakhstan (Ventresca Miller et al., 2014a; Motuzaite-Matuzeviciute et al. 2015) and the southern Trans-Urals (Hanks et al. 2018; Privat 2004). The isotopic composition of livestock, including horse, cattle, sheep, and goat, were compared from three Middle Bronze Age sites and one Late Bronze Age site in the region. Average δ13C and δ15N values were compared using an analysis of variance coupled with a Tukey’s post-hoc test to determine the statistical significance of differences between plants by unit and livestock species by site (R development core team). We employ δ13C and δ15N isoscape models as a heuristic device to infer how ancient livestock taxa may have exploited different vegetation communities in the steppe landscape. The modern floral biome is diverse in both study areas with a wide range of species identified and spatial variation in the isotopic composition of plants. Plant samples collected from the Bestamak study area (n = 37 units) included 52 species identified, from 4 plant functional types, with the number of species per 1 m2 unit ranging from 2 to 15 (average of 6.1 species/unit). Within the Lisakovsk study area, 43 collection units were investigated, and the number of plant species per 1 m2 collection unit ranged from 2 to 13, with an average of 6.8 species per unit. The Bestamak study area supported an equal abundance of grasses (47.6%) and flowering non-woody plants (46.7%), with 2.6% shrubs, and less than 2.9% trees and unidentified species. Similarly, the Lisakovsk study area had equal percentages of grasses (48.6%) and flowering non-woody plants (49.8%), with fewer than 2% trees, shrubs, and unidentified plants. Percentages of plant functional types were calculated based on the total number of plant types counted in each unit, which were then added together for each area (Bestamak or Lisakovsk). Comparatively, a higher number of plant species were identified in the vicinity of Lisakovsk (n = 82) than Bestamak (n = 52) (Supplementary Table 1). The absolute number of C4 plants identified in both study areas is low, as is the relative abundance of C4 plants. Of the 88 plants analyzed from vegetation units at Bestamak, four taxa are C4 plants, and all are grasses (three Cleistogenes spp. and one Eremopyrum spp.). Within vegetation units at Lisakovsk, 28 plants were analyzed, and only two taxa were C4 plants, one was a flowering non-woody plant (Koeleria gracilis) and the other a shrub (Euphorbia spp.). The relative abundance (density per square meter) of C4 plants, of those analyzed, was low at Bestamak and Lisakovsk at 0.04 and 0.1%, respectively. The range of isotopic variation among plants at both sites is large and comparable with other steppe regions (e.g., Makarewicz and Tuross 2006; Shishlina et al. 2012). In the vicinity of Bestamak, C3 plants (n = 84) exhibited δ13C values ranging from − 30.0 to − 23.6‰ and a wide range of δ15N values from − 2.4 to 9.9‰ (Tables 1 and 3). In the same zone, C4 plants (n = 4) yielded δ13C values ranging from − 15.2 to − 14.5‰ with δ15N values from − 1.6 to 3.4‰. Floral growth in sample units located close to water sources, either saline or fresh, were 3.4‰ higher on average in δ15N relative to units located at higher elevations. Average δ15N values were higher by ca. 3‰ for units located outside of a small village that is currently occupied (distance from settlement = 0.8 km for 5048, 2 km for 5049) and a unit (3067) situated 50 m from a plowed field, when compared with units located in the open steppe. Significant differences were identified in average δ15N values between all units (ANCOVA, p = 3.09 × 10−12; Supplemental Table 2) and between units; unit 5051 was removed due to its small sample size (ANCOVA, p = 1.68 × 10−9). Collection unit 5051 (n = 2) was located in a marshy area and exhibited the highest nitrogen isotope values (mean δ15N = 9.3‰) and was enriched in 15N by 4.9 to 9.2‰ relative to other units. Units with δ15N values ranging from 3.3 to 4.4‰ were located in areas close to the river (5053) and salt lake (5062), as well as in areas of anthropogenic activity near towns (5048 and 5049) and near a plowed field (5067). Units with the lowest δ15N values, ranging from − 0.1 to 1.6‰ were located in the open steppe (5044, 5045, 5047, and 5052). Units were combined into three vegetation communities including the open steppe (OS), areas of anthropogenic activity (AA) and riverine, salt lake, and marsh (RSL). Significant differences in δ15N values were identified between the plants in the open steppe and those in areas of anthropogenic activity and near water (ANCOVA, p = 1.41 × 10−11; Supplemental Table 2). No statistically significant isotopic variation was evident in carbon isotope values between units or vegetation communities (Supplemental Table 2). Phragmites communis (Cav.) Trin. ex Steud. In the vicinity of the Lisakovsk site, modern C3 plants (n = 26) had measured δ13C values ranging from − 30.7 to − 25.1‰ with a wide range of δ15N values from 1.0 to 8.2‰ (Table 2). Comparatively, C4 plants (n = 2) had measured δ13C values ranging from − 14.7 to − 13.8‰ and δ15N values from 8.4 to 9.3‰ (Tables 2 and 4). No significant differences were evident between units, although high mean δ13C values ranging from − 28.6 to − 26.1‰ were consistently identified in the open steppe and near the river, while the lowest plant carbon values were from the unit located at the edge of the saline lake (Fig. 3). Isotopic variation between collection units at Lisakovsk (n = 4) indicates that significant differences were identified in average δ15N values between unit 5013 and the other units (ANCOVA, p = 1.86 × 10─4), but no statistically significant isotopic variation was evident in carbon isotope values (ANCOVA, p = 0.59; Table 3). Unit 5013 has a significantly lower average nitrogen isotope composition than other units by 3.2‰ (Table 3). The remaining collection units had average nitrogen values ranging from 5.8 to 7.5‰ and were located in open steppe (5019, 5020) and near the Tobol River (5008). Puccinellia tenuissima Litv. ex V Krecz. The isoscapes indicate differences in the distribution of both carbon and nitrogen isotopes between the two study areas, with Lisakovsk exhibiting a more homogeneous plant carbon and nitrogen isotope compositions than Bestamak (Fig. 3; Tables 3 and 4). The Bestamak isoscape indicates greater variation in the spatial distribution of carbon isotope ratios, with plants located in marshy areas and near the salt lake enriched in 13C relative to plants located in the steppe and near the river. Comparatively, lower δ13C values in the Lisakovsk isoscape suggest that the area was wetter and had less saline soils. The nitrogen isoscape at Bestamak has a wide spread of values, with higher values in saline and marsh areas. The δ15N isoscape at Lisakovsk indicates higher nitrogen values in open steppe (~ 7‰) and near the river (~ 5‰), with the lowest nitrogen values near the saline lake (~ 3‰). Plants located in the open steppe at Lisakovsk are enriched in 15N by 4.9 to 7.1‰ relative to those at Bestamak. Domesticated livestock, including horses, cattle, sheep, and goats were recovered from the Bronze Age sites of Kamennyi Ambar, Bolshekaragansky, Bestamak and Lisakovsk. Different livestock taxa from these sites yield similar average values with no significant differences in average δ13C and δ15N values by taxa (Fig. 4; Table 5; ANCOVA, δ13C p = 0.17, δ15N p = 0.55). Inter-species carbon isotopic distinctions were visible across sites where horses were depleted in 13C on average by 0.7 to 1.5‰ relative to cattle and by 1.2 to 2.3‰ relative to sheep/goat. Kamennyi Ambar livestock exhibited the widest range of δ13C values from − 20.8 to − 17.1‰, while at Bolshekaragansky, δ13C values ranged from − 19.7 to − 18.5‰. At Bestamak, δ13C values ranged from − 20.0 to − 17.7‰, and at Lisakovsk, livestock had δ13C values ranging from − 20.8 to − 18.7‰. At Lisakovsk (ANCOVA, p = 1.28 × 10─5), a significant 0.9‰ depletion in 13C is visible in horses relative to cattle (Tukey post-hoc HSD, p = 0.0018) and a 1.2‰ depletion relative to sheep/goat (Tukey post-hoc HSD, p < 0.0005). Differences between species was also significant at Kamennyi Ambar, (ANCOVA, p = 0.0012); however, significant differences were identified only between sheep/goat and horses, not horses and cattle (Table 5). Horses were depleted in 13C, on average by 1.1‰ compared to cattle (Tukey post-hoc HSD, p = 0.65) and by 1.9‰ relative to sheep/goat (Tukey post-hoc HSD, p = 0.008). No significant nitrogen isotopic differences were visible between taxa or between sites. Horses were depleted in 15N relative to cattle at all sites, on average from 0.7 to 2.2‰, and horses were depleted in 15N by 0.8 to 2.8‰ compared to sheep/goat. Kamennyi Ambar livestock exhibited δ15N values from 3.2 to 9.8‰ and from δ13C values ranging from 4.7 to 6.9‰ at. A similarly low range of nitrogen isotopic variation was visible at Lisakovsk, with δ15N values ranging from 4.3 to 8.3‰. At Bolshekaragansky, livestock exhibit δ15N values ranging from 4.7 to 6.9‰, while at Bestamak, δ15N values range from 6.2 to 8.4‰. No significant differences were evident in nitrogen values between species at Kamennyi Ambar (ANCOVA, p = 0.66) or Lisakovsk (ANCOVA, p = 0.65). Comparatively, livestock from Kamennyi Ambar had a wider range of carbon and nitrogen isotope values than those from Lisakovsk (Table 4; Fig. 4). There is a strong relationship between vegetation community type (e.g., sedge marshes, saline marshes, and meadow steppes) and plant carbon and nitrogen isotopic compositions. High δ13C values in plants growing in saline marshes are likely driven by high soil salinity. The introduction of salts to soil water sources results in stomatal closure; thus, the partial 12CO2 pressure in the plant decreases forcing it to assimilate more 13CO2, increasing the 13C composition of the newly formed plant tissue (Farquhar et al. 1982; van Groenigen and van Kessel 2002). It is unclear how salt concentrations affect plant nutrient nitrogen in the soil (Heaton 1987). High δ15N values in saline areas could reflect the effects of denitrification and microbial mineralization, which produce 15N-enrichment of the remaining nitrate (Heaton 1987; Cloern et al. 2002; van Groenigen and van Kessel 2002). Low δ13C values and high δ15N values, averaging − 27.7 and 3.3‰ respectively, characterize sedge marshes located near lakes and rivers. Low δ13C values of sedge plants reflect high water availability and increased stomatal conductance. Previous research has demonstrated that plants from fresh water marshes are depleted in 13C relative to salt marsh growth (Tieszen 1994; van Groenigen and van Kessel 2002). The water-use efficiency of C3 plants increases as water availability decreases, as stomata conductance regulates the loss of water by transpiration; consequently, plants located in areas of abundant freshwater should have lower δ13C values than those in drier areas (Farquhar et al. 1982a; Farquhar et al. 1989; Lajtha and Getz 1993). Plants are enriched in 15N in wet locations and topographic depressions that provide moisture sinks, relative to drier areas (Handley et al. 1999). In locations where water accumulates, denitrification rates are highest and are related to greater N mineralization, resulting in N losses from the ecosystem and 15N enrichment of the residual N (Farrell et al. 1996; Garten and van Miegroet 1994). Plants in lower-lying portions of the landscape typically have higher δ15N values than those in upland areas. In our study areas, high floral δ15N values were identified in low-lying areas that were marshy or saline, as well as pastures located in the vicinity of towns. The diversity of carbon isotopic variation visible in meadow steppes likely reflects localized differences in topography that impact water availability. In the grassland environments of the Great Plains and Inner Mongolia, regions characterized by undulating topographic relief, floral growth in wetter areas such as depressions exhibits low δ13C values relative to those in upland areas (Tieszen and Bingyu 1990; Tieszen 1994). Localized soil salinity may also contribute to the wide range of δ13C variation in steppe meadows and in some cases may induce water stress in floral growth, even for plants growing water depressions that would otherwise support 13C depleted floral growth. In the case of Bestamak, low δ15N values were located in upland meadow steppe areas with low soil salinity. 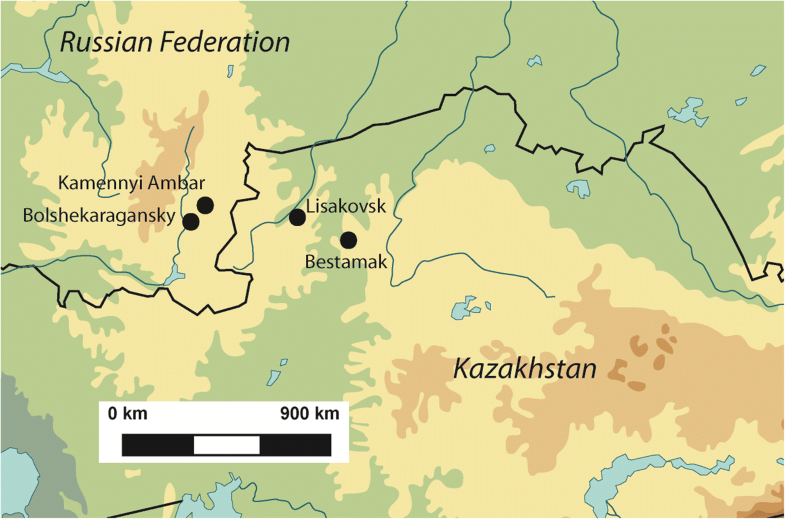 Comparatively, in open steppe areas, the 4.9 to 7.1‰ enrichment of plants from Lisakovsk to those at Bestamak likely reflects a higher stocking rate at the former study site. The Lisakovsk study area is located in the vicinity of a large town, and local populations use the steppe landscapes for intensive grazing of livestock year-round. Together, these factors contribute to 15N enriched plants at Lisakovsk via the continuous amendment of soils with exogenous nitrogen in the form of manure (Bol et al. 2005). Animal-derived nitrogen may be delivered to plants through purposeful application of manures or increased grazing intensity (Li et al. 2010; Xu et al. 2010). The absence of a relationship between stocking rate and the δ15N of soil, vegetation, and livestock, previously observed for sheep grazing in a semi-arid grassland steppe (Wittmer et al. 2011; Auserwald et al., 2012), is likely due to a combination of a relatively low stocking rate (0.375–2.25 sheep ha−1 a−1) and low soil nitrogen retention. The investigation of single season grazing on summer pastures, and the exclusion of winter pastures that tend to be grazed for longer periods of time and at greater intensity, may have led to low variation in the δ15N of livestock tissues. The pattern of bone collagen δ13C values of domestic animals, ranging from − 20.8 to ─ 18.5‰, strongly suggests that ancient livestock lived in an open environment dominated mainly by C3 plants. A wide range of variation in δ13C and δ15N values for ruminants at the site of Kamennyi Ambar (MBA) compared to the site of Lisakovsk (LBA) was evident, with δ13C values of 2.7 and 1.1‰ respectively, and with δ15N of 2.8 and 2.0‰, respectively. Wider variation evident among ruminants indicates that animal management strategies at the site of Kamennyi Ambar involved placing animals on pastures with high plant diversity or that livestock were led to pastures over a broader region. Foregut ruminants, such as cattle and caprines, have different physiologies than horses which are foregut fermenters (Menard et al. 2002), yet when fed identical diets, they have similar isotopic signatures (Sponheimer et al. 2003a, 2003b). Horses and cattle have high niche overlap, grazing on the same resources (Menard et al. 2002), with selection of old-field grasslands in all seasons. However, when presented with the opportunity, horses will feed in wet and moderately wet grasslands (Menard et al. 2002), which were likely exploited by herders in the Bronze Age. Our isotopic data suggests horses were grazed extensively across the steppe, while ruminants were grazed intensively in pastures with more isotopically variable plant communities, often located in close proximity to settlements. 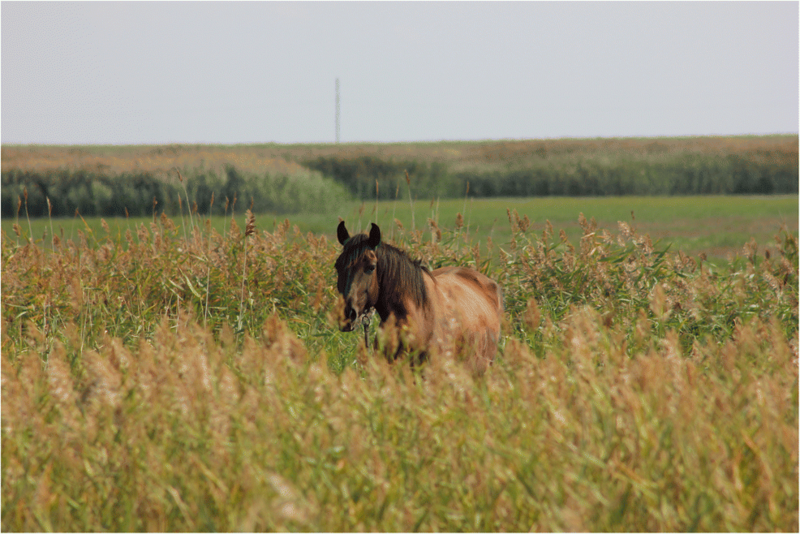 At Bestamak, the combination of low δ13C and δ15N values visible in horses suggests that they grazed on elevated open steppe zones supporting pastures characterized by low carbon and nitrogen plant values as visible in the modeled isoscapes. In addition, horses may have grazed on 13C-depleted forage in well-watered meadow steppe pastures that had moderate δ15N values (3.3‰). The pattern of 13C enrichment in cattle and caprines at Bestamak suggests that these animals grazed more often in saline and brackish marshes, or drier steppe meadows, comparable to those located near the center, southern, and eastern portions of the study area. Taken together, our results suggest that horses were grazed extensively over broader areas, while ruminants were grazed extensively in areas adjacent to settlements. As the contemporary Bestamak study area supports low human population and herd density, it may be that in prehistory greater anthropogenic effects alongside those from intensive grazing significantly altered the nitrogen isotopic composition of plants. The addition of animal manure increases plant δ15N values depending on the type, amount, and duration of application (Bogaard et al. 2007; Fraser et al. 2011; Szpak et al. 2012; Makarewicz 2014). Isoscapes from the Lisakovsk study area are relatively homogeneous, with 13C-depleted and 15N-enriched vegetation compared to Bestamak. Within this zone, there is variation, such as plants with low δ13C and δ15N values in the vicinity of the freshwater lake (unit 5013) in the northern portion of the study area, or in small vegetation communities to the south or east encompass well-watered meadow steppes (Fig. 5). Ancient horses were depleted in 13C and 15N relative to other livestock and grazed on plants with lower isotopic compositions, such as those found at the edges of freshwater lakes. Alternatively, horses could have accessed pastures that were less intensively grazed that fall outside of the study area in vegetation communities similar to those at Bestamak. The nitrogen isotopic composition of pastures located in close proximity to the ancient settlement may have been higher than those further away due to intensive landscape use. High nitrogen values across the modern landscape are likely due to intensive grazing or anthropogenic effects, which would likely have been less drastic in prehistory due to smaller population and herd sizes. The pattern of 13C and 15N enrichment in ancient cattle and caprines at Lisakovsk compared to horses suggests ruminants grazed on pasturage located in saline or brackish marshes, and sedge marshes located near waterways, such as the Tobol River which cross-cuts the study area from west to east. A wide range of isotopic variation among cattle and caprines may indicate that were separated into multiple small herds that grazed on distinct pastures (Fig. 6). 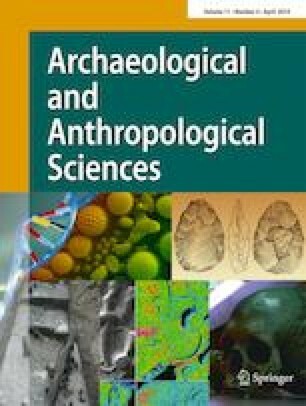 Stable isotopic research and data analysis for this manuscript were undertaken at the Archaeological Stable Isotope Laboratory (ASIL) at the University of Kiel. The authors are indebted to colleagues who assisted with the collection of samples in the field, especially Bryan Miller and Asa Cameron. Isoscapes were reconfigured with the help of Nils Vanwezer from the Max Planck Institute for the Science of Human History. Open access funding provided by Max Planck Society. AVM received support from the Gerda Henkel Foundation (Grant No. AZ 25/V/14) to undertake environmental sampling for this project. Support for isotopic analyses was funded by the Graduate School Human Development in Landscapes (GSHDL) and the Archeological Stable Isotope Laboratory (ASIL) at the University of Kiel.